Adding emojis to your social media posts is definitely something you should consider. As users become more and more accustomed to creativity in their social media feed, a post with some colorful emojis can make your message stand out in a crowd! According to Hootsuite, using emojis in your Facebook posts can increase your number of Likes by 57 percent, and comments and shares by 33 percent. Here are a few examples of how we use them in actual posts from some of our clients. 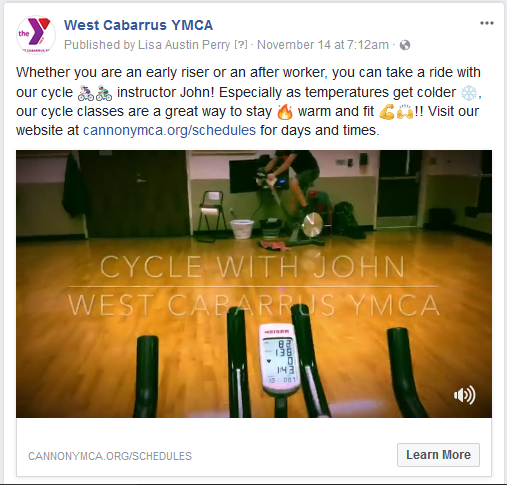 In this example for the West Cabarrus YMCA, we wanted people to immediately know that this was a video for a cycle class and that it is a great workout alternative for working out indoors during colder weather. For the Y, we frequently use the muscle emoji and the high five, so that there is consistency as well. 2. Bold or highlight a phrase that you want to stand out. Since Facebook does not give you the option to bold your text, you can use emojis instead to make something stand out. 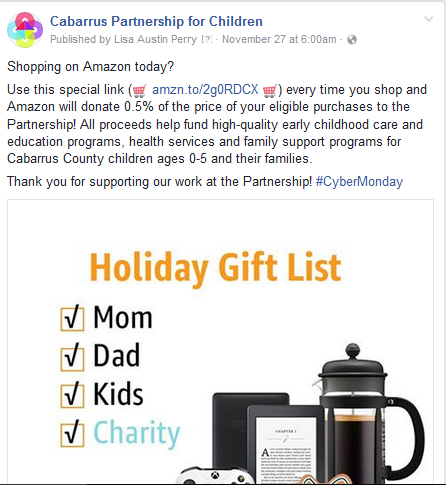 In this case, for the Cabarrus Partnership for Children, we wanted the URL to really POP so we used two shopping cart emojis on either side of the link. 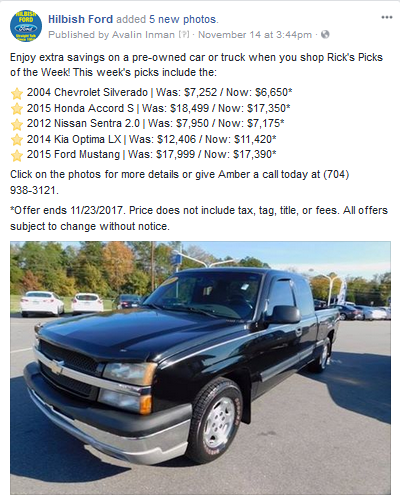 Facebook also does not give you the option to do a bulleted list, but in this post for Hilbish Ford, we were able to use the same star emoji multiple times to resemble a list and make each car stand out. 4. Make calls to action stand out with a different emoji for each. Sometimes using a few different emojis in a single post can really catch the users eye. 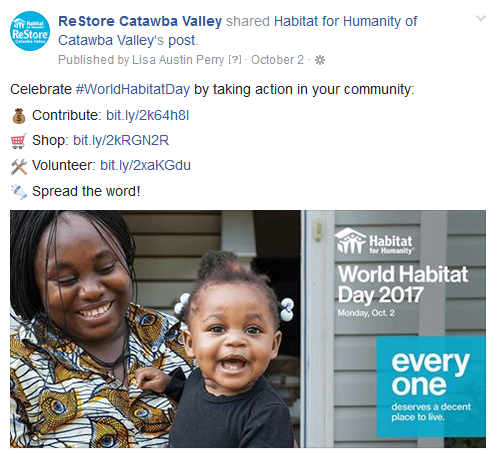 In this post for ReStore Catawba Valley, we were able to accent each call to action with a representative emoji. 5. Use emojis to create a clever script. 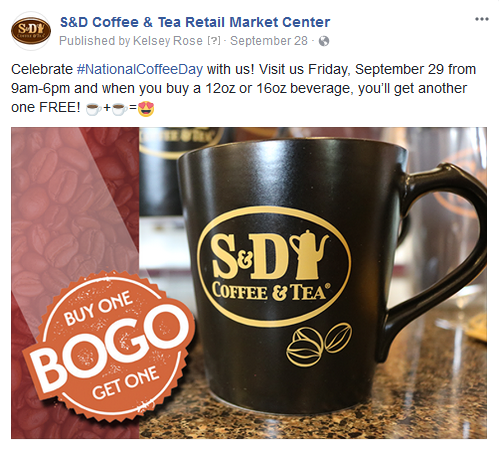 In this post for S&D Coffee & Tea Retail Market Center, we added the coffee plus coffee equals love equation to highlight the fun BOGO offer we were promoting. As you can see in these examples, emojis can definitely give your posts a little extra punch to get someone to stop and engage with your brand. Remember to make sure you know the meaning of the emojis before using them and try to land on a few that you use regularly for your image.